These characters are guaranteed to blow your mind—or someone else's. The Pathfinder Adventure Card Game Occult Adventures Character Deck 1 features three new characters who use mental attacks: the spiritualist Estra, the mesmerist Meligaster, and the psychic Rivani. 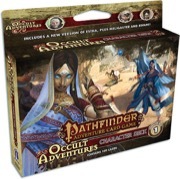 This 109-card accessory for the Pathfinder Adventure Card Game smartens up any Pathfinder Adventure Card Game Base Set or the Pathfinder Society Adventure Card Guild organized play campaign! Enjoying the different stykes each caster brings to the table, works well with Rune lords and Shackles, don't recommend them at all with Mummy's though, to many dirty traps upon examining and Maligaster gets shut down hard by all the undead. My first class deck purchase, and my limited Organized Play experience with it has been a blast! Making full use of cool new mechanics and under-utilized skills like Perception, and featuring three very different yet similarly powerful characters, the Occult Adventures Character Deck is a charming, balanced and thematic introduction to Organized Play. In particular, these classes tend to work best along with the Mummy's Mask set that interacts heavily with the heavy 'examining decks' theme of the Occult Adventures deck. Can't wait to see what the Kineticist will look like. Sadly, you'll have to wait another month. There was a slight mix-up with the product description—the Kineticist will be in Occult Adventures Character Deck 2. I've updated the product description. The artwork is not final (and its character selection is not correct).